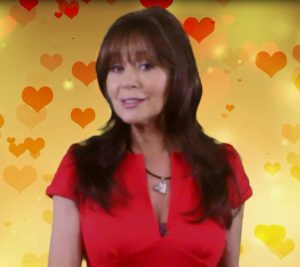 Host Jackie Watson, the French Reporter, along with Dr Ava Cadell bringing you celebrity romance news and some great ideas for your Valentine. Love Guru, Media Therapist, and World Wide Speaker, Dr. Ava Cadell is an accomplished author of seven books. When TV shows want ratings, they call Dr. Ava who has appeared on numerous national shows including Good Morning America, Extra, Montel, Geraldo, Anderson Cooper and networks; CNN, MSNBC, NBC, ABC, Fox News, MTV, VH1, Discovery, Lifetime, TLC, E! and A&E. A highly sought after speaker in the USA and Canada, throughout Europe, Africa, and Asia, Dr. Ava lectures to Fortune 500 organizations, religious groups, medical institutes, and colleges on the topics of romance, relationships, love, and human sexuality consistently drawing sell-out crowds. Founder of the Loveology University®, On-line University of Love Coaching, Dr. Ava has taken on the role as mentor to share her vast knowledge with motivated students who will become Certified Loveologists. Dr. Ava’s mission is to promote the benefits of healthy love and intimacy around the globe and training students worldwide is one way to spread her positive message. Dr. Ava has a doctorate in human behavior from Newport University, CA and a doctorate of education in human sexuality from the Institute for Advanced Study of Human Sexuality in San Francisco. Through her private practice in Los Angeles, she counsels people on personal issues that range from anger management, fear of intimacy, lack of communication, to lack of desire. Eye On South Florida (EOSF) is a division of Ethos Media Network (EOMN) a public company. EOSF provides media coverage, production services and media distribution locally, nationally and internationally. EOSF’s mission is to help groom the future of communication with less gloom, while helping to promote the beautiful essence of the arts, music, theater, education, lifestyle, tourism, nutrition and all things good that can create generations of successful individuals.